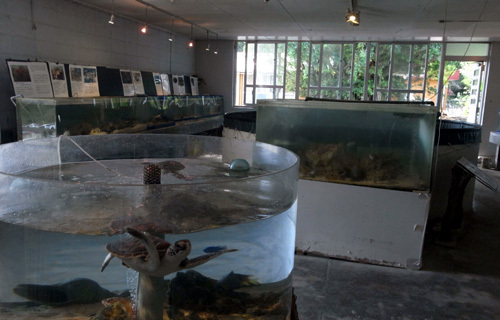 Animals inhabiting Kuroshima are displayed in this room. Sea turtles, coconut crabs, and venomous snakes specific to Okinawa, and other animals such as sharks and eels are bred in captivity. Three species of sea turtles, loggerhead sea turtle, green sea turtle, and hawksbill sea turtle inhabit in the Yamaeyama region. All three kinds of sea turtles can be viewed at our station. 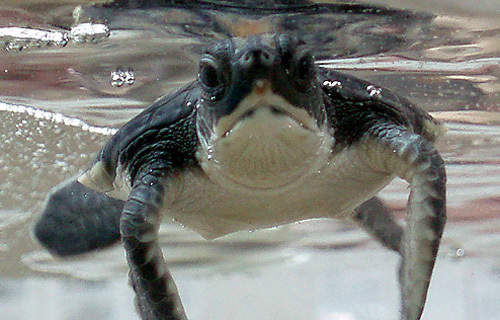 We also keep freshwater turtles to show the physical difference between sea turtles and freshwater turtles. Sea turtles are released to the sea during the summer or long vacation by hands of visitors. Everybody is welcomed to join. Information about the releasing event can be accessed via our home page. 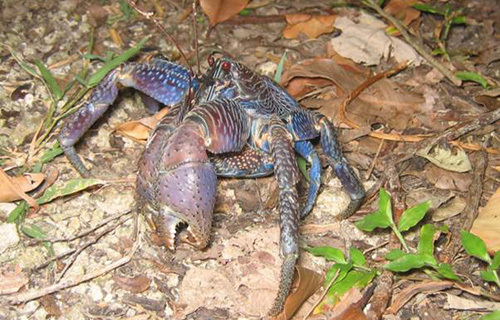 Coconut crab is the largest crustacean on land. It doesn’t carry a sea shell, but it’s belongs to the family of hermit crab. Coconut crabs are distributed only to the south of Amami islands. Some of the traditional performing arts of Kuroshima resemble people catching coconut crabs. This implies that coconut crabs have been quite common at Kuroshima island. However, overexploitation had decreased them in population and additional decline is concered. 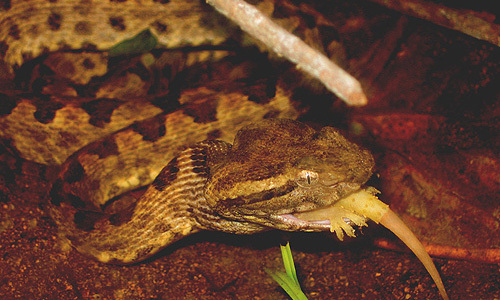 Sakishima habu has always been feared as a poisonous snake. Five species of habu inhabit in Japan but Sakishima habu is smaller and less poisonous compared to other habus inhabiting the main island of Okinawa. Death from Sakishima habu attack has not been reported in recent years. Sakishima habu is nocturnal, so it will not be encountered during the day. In addition, their habitat of traditional stone walls (ishigaki) and rocky areas is decreasing, which makes it more difficult to sight one. 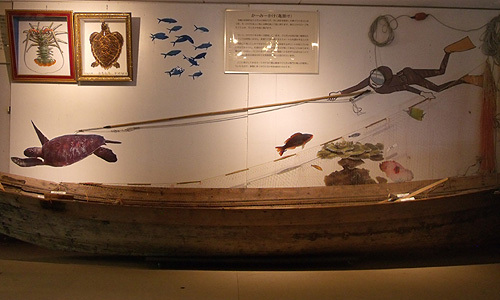 Kuroshima Research Station is the only place in Yaeyama islands where living habu is displayed. 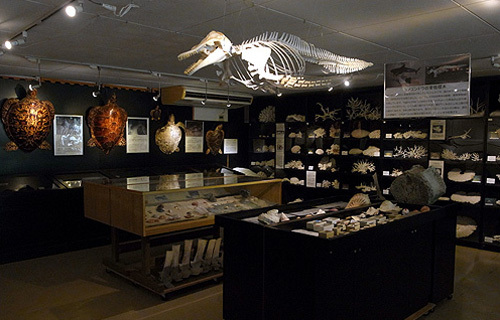 Stuffed sea turtles, coral reef specimens, human artifacts from Yaeyama region are displayed in this room. Main exhibitions are explained below. Kamikake is a traditional sea turtle fishing method in Okinawa. Fishermen slowly get close to sea turtle and hook it with the large hook fixated on tip of the long wood stick. That hook is connected to a long rope and fishermen tug the rope from the ship, finally catching it. Numbers of fisherman who can perform Kamikake are dramatically decreasing. Sea turtles are very sensitive to sound of air bubbles so fishermen will not be diving with a tank. Skin diving is required for this method and diving depth could reach 30 meters. Fishermen also need to know sea turtle resting point, enabling only skilled and trained fishermen to perform the task. Sharks are sometimes lured by blood from caught sea turtles. Another threat is fishermen getting tangled up by rope and sea turtle can lure fishermen in to the deep sea. These are the reasons why Kamikake is said to be one of the dangerous fishing method. Kamikakae tools displayed at our station were donated by the last sea turtle fishermen in the Yaeyama region. Those were actually used for hunting many sea turtles. Specimens are not only a target of study, but are concrete evidence which prove the existence of creature in the past. 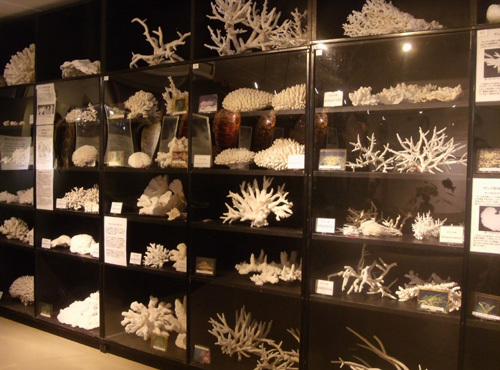 This station owns one of largest collections of approximately 1,000 coral specimens. 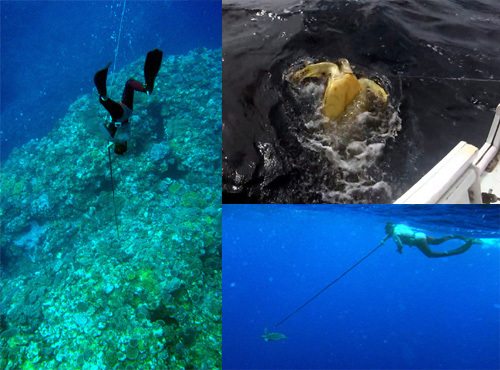 Most samples were collected in between 1970 and 80s and they are the only existing evidence that hints the magnificence of Yaeyama coral reefs back in those days. Specimens had been classified and classification data is now complied into a booklet under the supervision of Japanese Society for Coral Taxonomy.